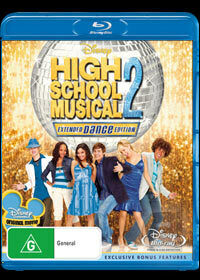 Just in time for the latest High School Musical film, High School Musical 2 - Extended Dance Edition blasts its way onto Blu-ray with the definitive version of this boppy musical that can be watched by children of all ages. Although, younger girls will simply adore Zac Efron as he dances and sings his way with his Hollywood good looks and voice that is actually quite impressive. Once again the stars of the first movie have returned with a variety of new faces, however this current story revolves around Troy, the captain of his school's basketball team and the gorgeous yet studious Gabriella who join forces in some quite entertaining musical pieces. Unlike the previous film, this movie is set during the summer break as the entire gang are working at a country club which is founded by Ryan and Sharpay's family. Fortunately for the guests of the club, the annual talent show is about to begin and when Troy begins to sing with Sharpay, Gabrielle becomes quite jealous, even though they are not officially together. It's a great teenage movie about relationships, feelings and life that will make this a must have for all teenage girls. Where the Blu-Ray version does shine is through the special features and the video/audio quality that include high definition video and audio which go hand-in-hand with the enthralling storyline. The picture quality is extremely sharp that is matched with vibrant colours and really lends itself well to the Blu-Ray format. The high definition 5.1 audio track is pure bliss, especially when the songs began which makes it difficult not to get up and start dancing. Definitely a great compilation of one of the best Teenage movies available!